The Armada, in the historic Old City, puts you in the centre of genuine Istanbul. Unmissable sights such as Topkapı Palace and Ayasofya are a stroll away. The rooftop restaurant, with views of the Blue Mosque and the Sea of Marmara, is the perfect setting for a drink or dinner by moonlight to the rhythms of live gypsy music or traditional fasil. The long-lived Armada Hotel in Cankurtaran, the sea-facing side of Sultanahmet, manages the tricky balancing act of being a largeish property that still somehow manages to feel like a boutique hotel. It does this in part thanks to an original decorative scheme featuring flowers delicately painted onto wooden panelling and in part through the little extra touches that suggest the personality of the owner: the terrapins swimming amid fragments of Byzantine marble in the pool in the lobby, the lovely tropical birds in individually designed cages near the restaurant, and the paintings of Bosphorus boats worked in the camaltı (under-glass) technique that used to be popular in Central Anatolia. The Armada has always been a hotel that had good food at its heart. 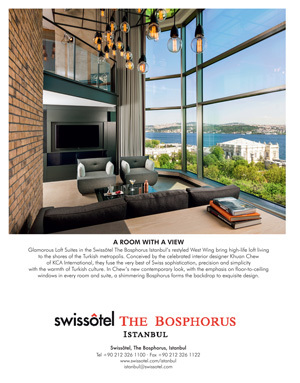 The top floor features the Sera Restaurant, a romantically lit gourmet restaurant that offers degustation menus for those who’d like to sample a range of unfamiliar Turkish treats, as well as Tuesday wine and cheese nights that aim to introduce guests to the ever growing range of Turkish wines. In summer the restaurant spills over onto the terrace, landing diners a wonderful view of the Sultanahmet Camii (Blue Mosque). Rooms are pleasantly spacious with inviting bathrooms (showers, no tubs) and a small sitting area by the window. Those at the front look straight out over the ruins of the Ahırkapı (Stable Gate) in the old city walls to the Sea of Marmara beyond, a spectacular sight to wake up to on a sunny day. Pat Yale is a writer and journalist based in Cappadocia. She is the co-author of Istanbul – The Ultimate Guide and winner of the 2015 Ancient and Modern Prize for her ongoing project to explore Turkey in the footsteps of Gertrude Bell.